Microwaves, dishwashers, refrigerators, freezers, washer, dryers and many other appliances are what make our modern life more comfortable and we all take them for granted. That is until one of them breaks down. Then we panic and start looking for Los Angeles appliance repair services that would provide the necessary repairs right away. Unfortunately with most of the companies you have to wait for hours, even days for the repairman to show up and check the appliance. Even then, there is a chance that the repairman has to order a part for the appliance and then the wait begins. Just imagine the case where your air conditioner goes down in the middle of the summer. With AM PM Appliance repair that is not the case. AM PM Los Angeles appliance service can provide the necessary repairs on the same day you make the call, or at any time that is convenient for you. Our repairmen also carry necessary parts on their trucks, so chances are the part that is needed to repair your appliance is there and you do not have to order it from the company and wait for it to arrive. 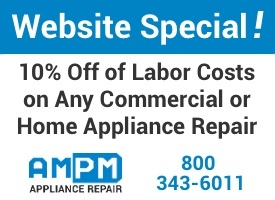 AM PM Appliance Repair service Los Angeles provides repairs 24 hours a day and 7 days a week, so you can be confident that any time during the day or even on weekends, you can receive the services you need and have your appliance repaired as soon as possible. We offer our services throughout the Los Angeles county and repair brands including Thermadore, Sub Zero, Kitchen Aid, Whirlpool, Kenmore, GE, LG, Haier, Electrolux, Jenn Air, Wolf, Magic Chef and many more. We also offer a 5 year warranty. No matter how well you take care of your appliances, they are going to need repairs someday. You can depend on AM PM Los Angeles appliance service to provide the services efficiently and in a timely manner, without disturbing your life and at the time of your convenience.